It’s amazing how stressful life can be. You know the days I’m talking about? The ones where it feels like the pressures and concerns of the entire world are resting squarely on your shoulders. Now sure, none of us have the whole world depending on us, but let’s face it: life can be demanding and it’s easy to become completely overwhelmed. Whether it is work responsibilities piling up, stress with school, worries over volunteer work or even long days at home with kids, none of us are immune to stress and the feeling of being overwhelmed. I know that I have been there more times than I care to admit, but I have learned some things along the way. I now have a little system that I implement when I am starting to feel overwhelmed. These simple steps have helped me so much! I hope they help you too! Take a moment to Breathe – Even if it is just 5 minutes hiding in the bathroom, take a moment to breathe deeply and clear your mind. Use this time to pray and tell God openly how you are feeling. Ask for His wisdom in handling the situation you are in, and strength to make it through. Assess the Source of the Stress – It can be extremely helpful if you can pinpoint a specific reason (or reasons) for the overwhelming feelings of stress. Knowing what is causing it, gives you a starting point for working through it. Are you setting too high of expectations on yourself? Do you not have enough time to do everything you have committed to do? Is it a time management issue? Instead of blaming the stress on the general “everything”, try to identify the main source of the stress. You will know you’ve found the source when you can feel assured that, if it weren’t for those things, your stress levels would be much lower and everything else wouldn’t appear so worrisome. Reassess Your Commitments – Look at the source of your stress and see if you can work out a solution. Are you stressed about something outside of your control? Spend time in prayer surrendering your fears to God. 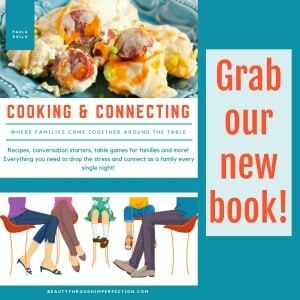 Is there something that is hindering you from managing your time efficiently (tv, blogging, book reading…)? Consider doing without that distraction for a week or two. Is it and unnecessary commitment that is weighing you down? Consider if you want to slowly step away from that commitment. If it is not something that you are able or willing to give up, then spend time exploring solutions that could make your stressful situation easier. Would a few hours of rest or solitude be enough to rejuvenate you? If so, figure out a way to make that happen! When it doesn’t go away – There are times when the depression and feeling of being overwhelmed just won’t go away. In these cases, don’t be afraid to reach out for help! Consult your ob/gyn to see if she can help you with postpartum depression or consider seeing a counselor to talk through some of the things that are overwhelming you. These aren’t signs of weakness, they are simply steps to take to help you be healthy! If you had a broken leg no one would call you weak for going to the doctor, seeing a doctor for depression, hormonal problems, or the constant feeling of being overwhelmed is no different. Find the strength to reach out for help! These tips may seem a bit straight forward, but they can oftentimes be difficult to remember or practice in a moment of stress. Keep them in mind for the next time you are having a hard day and see what a difference it makes for you! What is your number one way to deal with stress? I’d love to hear more tips! How timely – I had a meltdown today in the middle of a fast food restaurant over coupon usage. Yikes. Then I just sat at the table with my husband and cried. Poor guy, he kept saying “It’s OK, it’s OK.” I’m definitely feeling overwhelmed, and you are right, these 3 things really do help. Sadly enough, I do typically feel better after I cry….but I sure would like to get to the point where I don’t have to have a meltdown and be rude to feel better. Worst of all, I realized later that I had been wearing my cross necklace when my bad behavior happened. Great witness, huh? Thank goodness for grace. You’re right: these tips are straightforward but it’s so easy to forget them in the midst of the hustle and bustle of life. I get overwhelmed easily and then it leads to feeling really down. So I am learning to try to manage those feelings of being overwhelmed. Hi Paula! I am visiting from Monday Musings. Wow, these are really good, grounding tips. I do tend to get overwhelmed, and I sure know where the bathroom is! I was thinking today that I need to relax and enjoy more. This is a timely post for me. Great advice! I often do these three steps myself when I feel overwhelmed. Thanks for posting! Good tips for de-stressing, and for finding time and calmness to spend more time in close company with God! I’ve been thinking over that last one lately, especially. I guess we all need to periodically in these overloaded times! Love this! When I get overwhelmed, I like taking a moment to go outside if it’s nice out. Just sitting in the sun for a few minutes calms me down so quickly! I have a definite area of stress but it is something I just have to learn to live with because I have no control. I try to stay away from the source which is a person, but this person has ways to hurt others through sweet grandchildren. Please pray for a solution. Thansk. Great post, Paula! I find it is very easy to get overwhelmed especially when I’m tired. So when I feel the urge to throw my hands up and run away to Mongolia,I know it’s time to take a nap! Your point of taking just a few minutes to Breathe is excellent! We so often rush through our days, not realizing that we simply can’t sustain such prolonged effort. (Superwoman??) It’s very important for us to be careful what we eat, and to try to get enough rest. Beautiful! 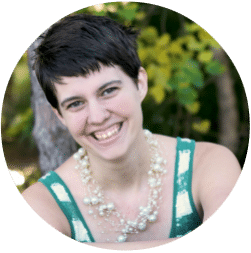 One of our other writers, Angela, wrote on a similar subject recently: http://thirty-one10.com/faith/overwhelmed/ I thought you might like to read her suggestions! what a great post! these things are so important! I am really overwhelmed with teaching two Spanish classes, teaching an English class, helping my friends, teaching kids, cleaning the house, making diner, and grading home work. Hope this helps, thanks a lot! 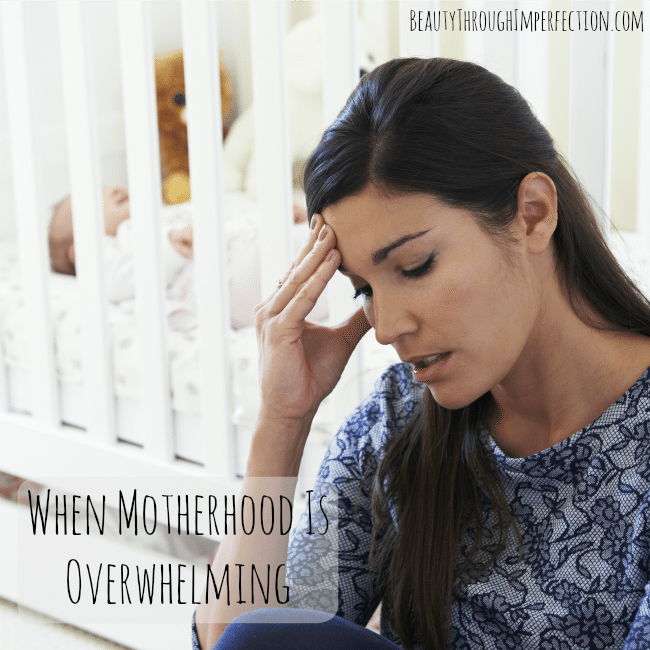 Hey Buddy!, I found this information for you: "When You Are Feeling Overwhelmed By Motherhood". Here is the website link: https://www.beautythroughimperfection.com/feeling-overwhelmed/. Thank you.